Denver Web Success only works with local, Denver based companies (see service areas) and a large part of our work is with small businesses and brick-and-mortar stores that are trying to capture the local, Denver market. Almost all consumers are using the internet to search for local products and services, no longer relying on print advertising or phone books. These potential clients are searching by either including their location as part of their search, or by relying on the search engine to show them relevant, local companies. Today, someone in your area will search for what you sell. Will they find you? A study (Comscore) found that nearly all (96%) of PC users conduct local searches. Now in many cases they may be looking for a specific business, but a little under half of these searches are looking for a business they have never used before – these are your potential new customers. Regardless of whether it’s from a desktop, tablet, or phone, the vast majority of searches turned into purchases. You may already believe that your website ranks well, but it is best to get a free checkup and be sure, which Denver Web Success will carry out as part of our free Website Services Client Engagement Process. Studies show that over 40% of searches include a local identifier, such as the city name or zip code. However, many more searches do not include any geographic information, with the searcher simply relying on the search engine to show relevant, local results. Fortunately, search engines have become much better at distinguishing these local searches and often include a local “pack” (the local/map results), often appearing above most, or all, of the organic listings. Ideally, you would like your website to appear in both the local pack and the organic first page listings. These used to require distinct strategies. However, since Google’s “Pigeon” update (July 2014) everything appears to be based more closely on the search engine optimization of your website. 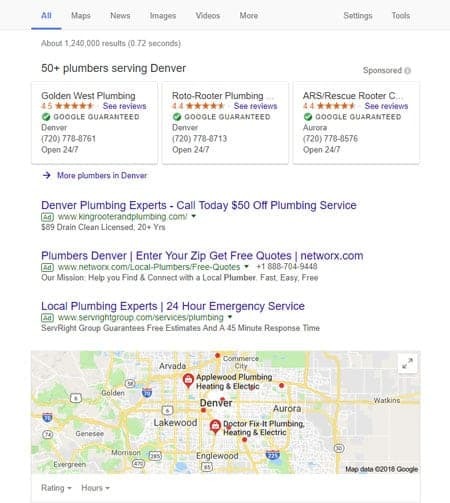 Denver Web Success, your ideal partner for local search engine ranking, will help you ensure your website is visible in the local pack (local/map results) as well as the organic searches, driving new business and revenue to achieve a substatntial return on investment.